Wiring puzzles and the "Enigma"
Note to user: This section contains only one illustration, but many more, with a comprehensive explanation and history, can be found in the Wikipedia article "Enigma Machine," also in a set of web pages by Dirk Rijmenants, parts of which tell the story in greater detail and even provide an "Enigma simulator" program. Below is a simplified description of the machine (you can skip technical details, if you want). Up to now only simple switches were discussed: more elaborate ones also exist, providing the electrical current with a larger number of choices. 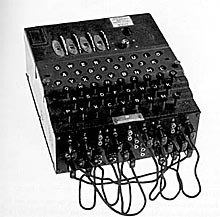 Switches with 26 choices, each corresponding to some letter of the alphabet, were behind the famous "Enigma" coding machine used by the German armed forces in World War II. At the heart of the "Enigma" was a set of three disks (or "rotors") able to rotate around a common shaft, each with 26 matching metal contacts circling the center, on the front and on the back of the disk. Inside each disk, wires scrambled the order of electrical contacts, so that current entering (say) the front-side contact corresponding to the letter "A" would arrive at the rear-side contact corresponding to (say) "J". The contacts could be labeled A, B, C... Y, Z, one for each letter of the alphabet, and each was capable of making an electrical connection with the facing contact touching it. The machine had a keyboard like a typewriter, and also a set of 26 lightbulbs, electrically connected to the 26 electrical contacts on the front of the first disk. Each of these contacts could link electric current either into the machine from a key corresponding to a letter, or out of it to a lightbulb corresponding to another one. It could not do both at the same time: when the "A" key was pressed, the contact to the "A" lightbulb was interrupted and that lightbulb stayed dark. However, the same key also connected the battery to the "A" contact of the first disk, and that lit a lightbulb at the end of all the complicated connections inside the machine. When the operator pressed the key "K" (say), the source voltage was connected to the contact on the first disk corresponding to "K". The contact at the back of the disk would then connect the corresponding contact (always a different one) on the second disk, and from there the voltage would be passed to the contact on the third disk. In the back of the machine was a "plugboard" of scrambling wires, which returned the electrical current to disk "3" in some different place, and from there through "2" and "1" to the lightbulb marking the encoded letter. If one pressed key K, for instance, the plugboard would return the current through the three disks in reverse order, reaching the contact of the letter "D", and the "D" lighbulb would then glow. The plugboard ensured that the electrical path back to the first disk was different from the one by which the current reached the plugboard, so that when "K" was pressed, the current could never flow back to the "K" contact again, but always to a different letter. As noted above, inside each of the disks, hidden from view, were wires that routed the power from each input contact to some other contact on the output side. So if "K" was pressed, the current may emerge from the "M" contact on the other side, the touching contacts might feed it back to "C" of the second disk (which may have been rotated to a different angle than the first), and it might be further scrambled by the wires inside that disk to "F". The third disk added another scrambling, and so did the plugboard, and the connections were further scrambled on their way back through the 3 disks--by the wiring of the 3rd, then 2nd, then 1st disk, to a set of lamps labeled with letters A, B, C ... Z. At this stage, all this would produce would be a fixed substitution code--"D" for "K", "Q" for "E" and so forth, depending on the setting of the disks and plugs. Such codes are easily broken. What set the "Enigma" apart was that each time a letter was typed into the machine, the rotors turned by different amounts, constantly changing their combinations. In the original Enigma, the rotors were turned by a small transfer gear, as in the mechanical odometer of a car (see photograph labeled "gear type advance mechanism..." here). Each rotor had on its forward-facing side a cogwheel (you can imagine it as having 26 teeth; actually, a ratchet wheel with 26 cogs controlled the settings), and on its back-facing side one cog stuck out. Whenever a key was pressed, the first wheel rotated one cog, so the next letter typed had a different connection to disk 2. Once in each rotation the single cog sticking out of the rear side of the wheel reached the transfer gear, turned it by one cog and caused the second disk to advance by one letter; and once every rotation of the second gear, the transfer to the next transfer-gear rotated disk 3. In a car odometer, each wheel has 10 cogs, so adjacent gears count single miles or kilometers, tens, hundreds and so on. Here each wheel had 26 positions. Later models of the enigma used ratchets, gears with sloping gears, in which a small lever ("pawl") pushed against them and only allowed rotation in one direction. Instead of a single projecting cog, the rear-facing side of each disk carried a wheel with one notch (acting like a ratchet with one cog), and when that notch reached the position of the pawl, the pawl slid into it and moved the next ratchet one letter ahead. The overall result was the same. The initial setting of the wheels (done by hand differently each day) was all important, for it decided all later settings in sequence. Furthermore, the wheels were removable and a choice of replacement wheels was provided, allowing many choices of initial settings. And the connections between key and lamp were symmetric: if on step 526 (say) key "A" connected to lamp "S", the two were connected by a complex electric path, but the same path could be traced in the opposite direction--key "S" would activate lamp "A". This way, when the encrypted message was typed on another Enigma machine at the receiving end with the same settings, the lights would spell out the hidden message and decode it.